An observatory tower which also houses several offices parallels the form of an obelisk symbolising the arrival of both death and rebirth. It marks both the beginning and end of a circular elevated pathway, a palindrome framing the ever-changing boundary of the Nile and a village of dwellings east of it. More often than not, the history of ancient Egyptian focuses solely on aristocrats and noblemen. The mud huts complex represents the peasants, slaves, and fishermen the ancient civilisation built upon. The village makes it crucial to the positioning of the construction. These are repurposed as functioning interactive spaces of the grand scale museum, bounding the experience back to human scale of walking through the dwellings. 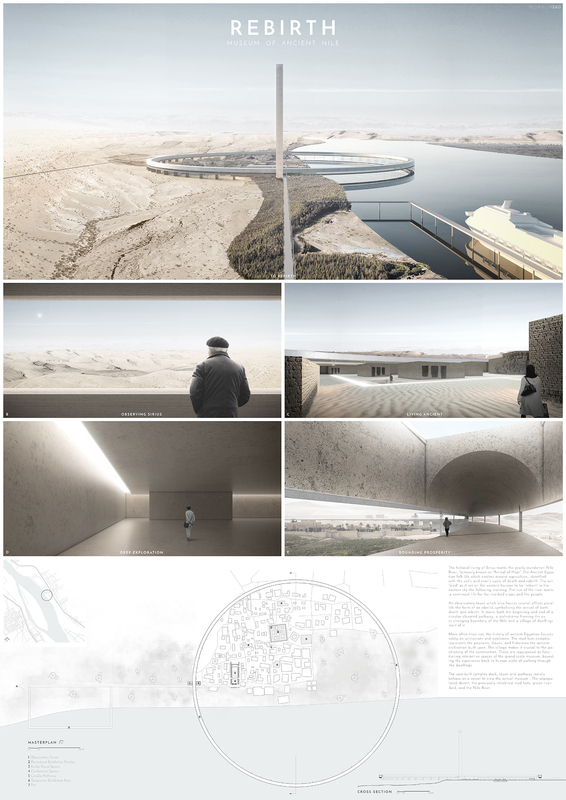 The vast built complex dock, tower and pathway merely behave as a vessel to view the actual museum : The unpopulated desert, the previously inhabited mud huts, green riverbed, and the Nile River.